Biblical King Herod left a lasting legacy of temples and palaces around what is now Israel. One of his most stunning achievements was a new port city on the Mediterranean coast. In 40 B.C., the Roman Senate named Herod, whose Nabatean ancestors had converted to Judaism, the “King of the Jews,” with authority over Judea, Galilee and Peraea. Herod’s little kingdom along the eastern Mediterranean was a dusty backwater, lacking even a suitable harbor. Herod soon undertook a number of massive construction projects, both to gain the loyalty of Jews wary of his ethnicity and to impress his superiors in Rome. To create an artificial harbor, Herod’s engineers designed breakwaters extending several hundred meters from the straight Mediterranean shoreline. Divers, trained to stay underwater for five minutes, placed forms on the seabed and filled them with concrete that hardened under water. 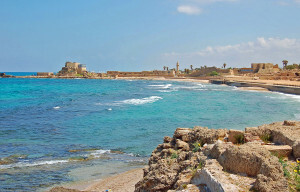 When completed in about 13 B.C., the harbor, 25 miles north of Jaffa, was the largest on the Mediterranean. Herod constructed a 164-acre city adjacent the harbor, named “Caesarea” in honor of Caesar Augustus. Home to 100,000 people, Caesarea included 100 warehouses for products passing through the port, a temple to Augustus, a lighthouse, a hippodrome and a 4000-seat theatre. A thirteen-mile-long aqueduct, sections of which are still standing, brought water to the city, which became the Roman capital of Judea in 6 A.D. Herod’s city, which rivaled Alexandria, is now called “Caesarea Maritima” to distinguish it from Caesarea Philippi.